Answer a call. When you hear or feel the call notification, raise your wrist to see who’s calling. Tap the Answer button on Apple Watch to talk using the built-in microphone and speaker. To answer using iPhone or send a text message instead, turn the Digital Crown to scroll down, then tap an option. Hold a call. Tap “Answer on iPhone” to place the call on hold until you can continue it on your paired iPhone. The caller hears a repeated sound until you pick up the call. If you can’t find your iPhone, tap the Ping iPhone button on Apple Watch to locate it. 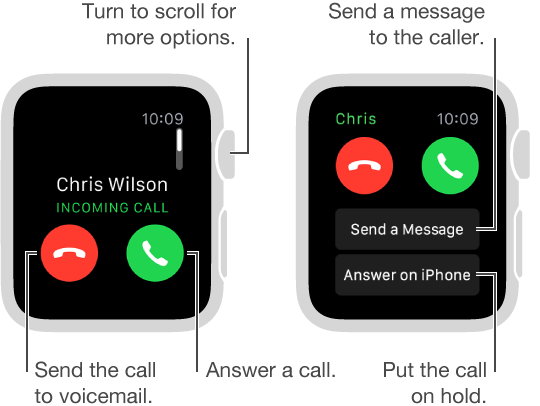 Switch a call from Apple Watch to iPhone. While talking on Apple Watch, just swipe up on the Phone icon in the bottom-left corner of the iPhone Lock screen. Or, if iPhone is unlocked, tap the green bar at the top of the screen. Adjust call volume. 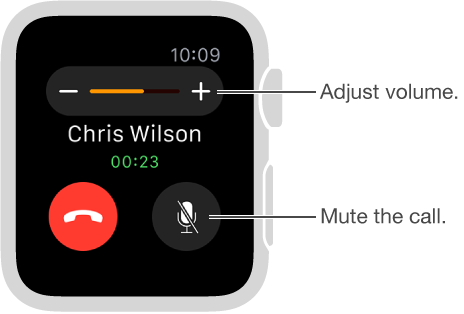 To adjust the speaker volume when talking on Apple Watch, turn the Digital Crown while on the call or tap the volume symbols on the screen. Tap the Mute button to mute your end of the call (if you’re listening on a conference call, for example). You can also quickly mute an incoming call by pressing the palm of your hand on the watch display and holding it there for three seconds. You must first turn on the option in the Apple Watch app on iPhone. Tap My Watch, tap Sounds & Haptics, then turn on Cover to Mute. Send a call to voicemail. Tap the red Decline button in the incoming call notification. Listen to voicemail. If a caller leaves voicemail, you get a notification—tap the Play button in the notification to listen. To listen to voicemail later, open the Phone app , then tap Voicemail.